This puppy was rejected by his mother at birth. Lucky for him he was born on the same day as this litter of kittens and mama cat is happy to take him into her family. 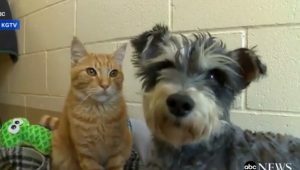 Romeo the cat and Juliet the dog were found huddled under a car together, and when they got to the shelter, it was clear that they were madly in love.